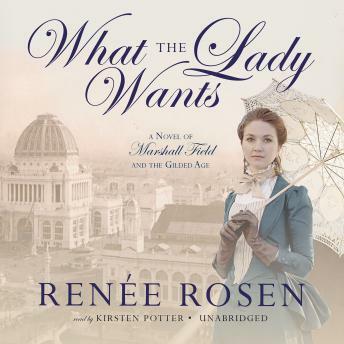 In late-nineteenth-century Chicago, visionary retail tycoon Marshall Field made his fortune wooing women customers with his famous motto, “Give the lady what she wants.” His legendary charm also won the heart of socialite Delia Spencer and led to an infamous love affair. The night of the Great Fire, as seventeen-year-old Delia watches the flames rise and consume what was the pioneer town of Chicago, she can’t imagine how much her life, her city, and her whole world are about to change—nor can she guess that the agent of that change will not simply be the fire but more so the man she meets that night. But behind the opulence, their private lives are riddled with scandal and heartbreak. Delia and Marshall first turn to each other out of loneliness, but as their love deepens, they will stand together despite disgrace and ostracism, through an age of devastation and opportunity, when an adolescent Chicago is transformed into the gleaming White City of Chicago’s World’s Fair of 1893.